Sometimes when you first meet someone, they already seem familiar to you. It is a familiarity like the stars in the sky—they have always been there, always shining, but far away … until now. Estelle is like this. So it should come as no surprise her Society name means star. And in my eyes, she is a star of our Society. Fair warning: There may be a bit of gushing in this article. THL Estelle de la Mer (formerly known as Hiordis Ragnarsdottir) is one of those persons who does many things very well. Her first love is the scribal arts, and many of us have been recipients of her stunning scrolls. But she also does pewter casting, fingerloop braiding, silk painting, trichinopoly (knitted wire chains), knitting, bread making, and — it seems to me — nearly everything else. Just from my own perspective as a costumer, she makes beautiful clothing for herself and her family, including excellent pleatwork! During one long car ride (from an A&S competition in which her scroll took a first place), Estelle told me about herself. She’s been in the SCA for quite a long time now—she joined in 1999 and received her Award of Arms more than a dozen years ago. 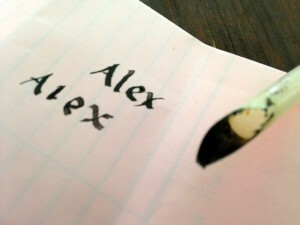 But she’s been doing calligraphy since before she joined the SCA, having started at the tender age of 12. She began doing scrolls for Society members 8 years ago, when she asked Baroness Angelique if she could work on a backlog scroll. 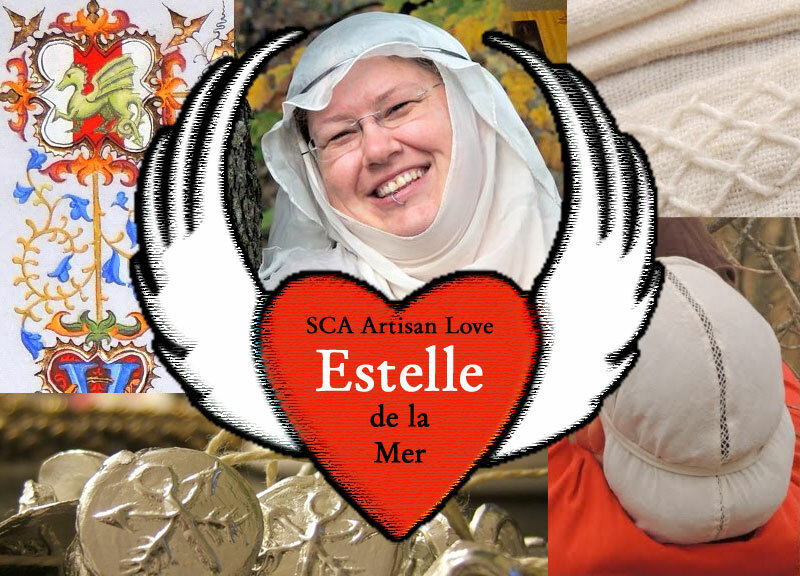 What keeps her doing it all these years is US — Estelle loves to see the faces of the people who get her scrolls. “The wonder and joy when they see their scroll is the best!” says Estelle. There’s more to making a scroll, of course. It’s quite a lot of difficult work, and Estelle told me she finds the layout to be the hardest part. But she also confided something else: “And then I get the paint out, and it’s like something magical, like the art just grows out of your hand, and you’re just a conduit for this living thing that blossoms from the end of your paintbrush, and when you’re done, it’s like the scales fall from your eyes and you behold something that you have no clue where it came from even though you were there throughout the miracle of its creation.” Well said, Estelle! I ask all the artisans about their favorite project. This is a tough question, paramount to choosing a favorite child. Estelle tends to favor her latest project, whatever it may be. 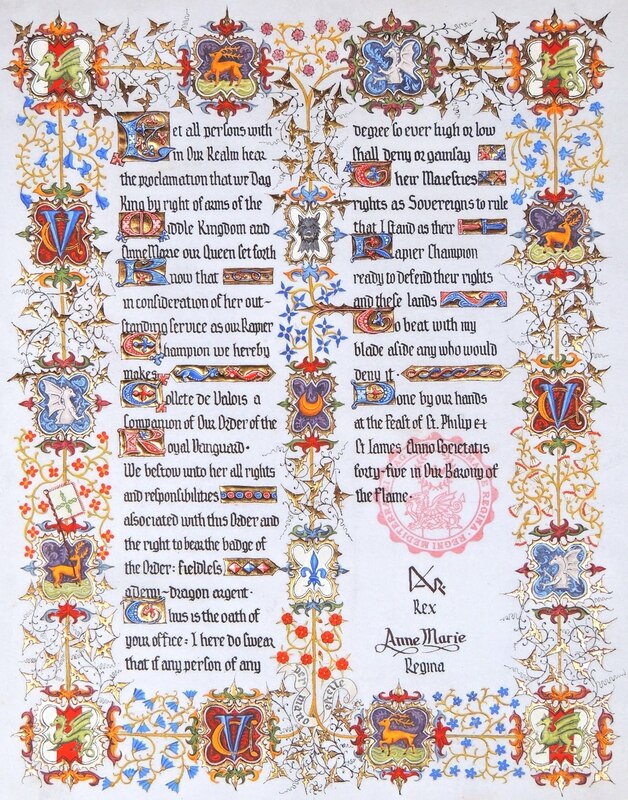 When I asked, she cited her the scrolls she made for Baroness Colette’s Royal Vanguard and Mistress Arina’s entry into the Order of the Laurel, which are both shown below (click the images to learn more about how Estelle made the scrolls). Estelle maintains a gallery of her scrolls at http://www.estelledelamer.net/—I see over 25 stunning scrolls there, and I know this is not all of her work. Her web site also has handouts for her classes—there are at least eight available for download immediately! Her many other projects, from a 13th c. pleated filet hat and a girdle book chemise to silk war banners and a book binding sewing frame, are also detailed with photos. 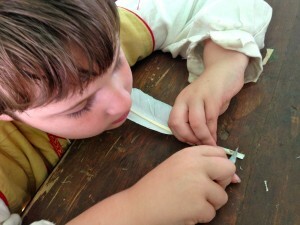 One of the classes Estelle teaches is how to cut a quill pen, because she feels that most persons who lived before 1600 would know how to do this. It so happens she taught this at Pennsic this year. 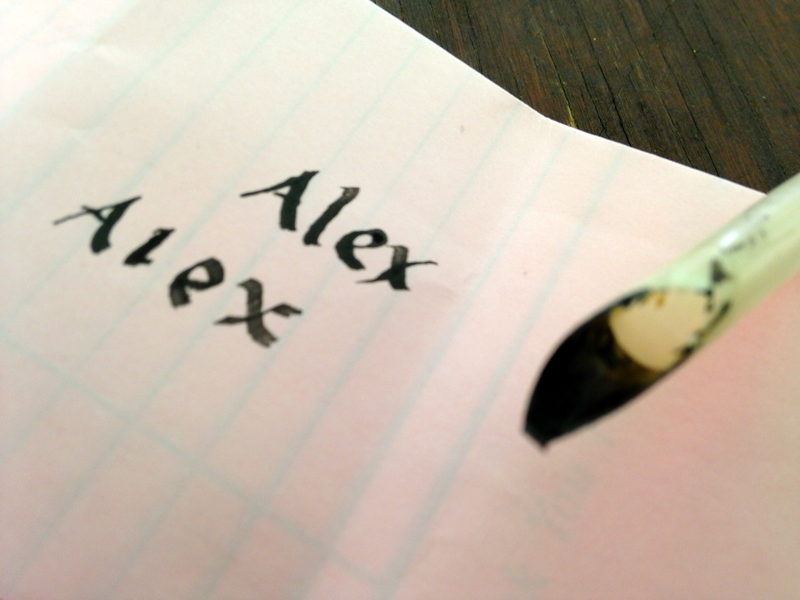 Alexander and I had the good fortune to take her class and I was amazed at both how simple it was and what beautiful writing we achieved from the finished quill pen. 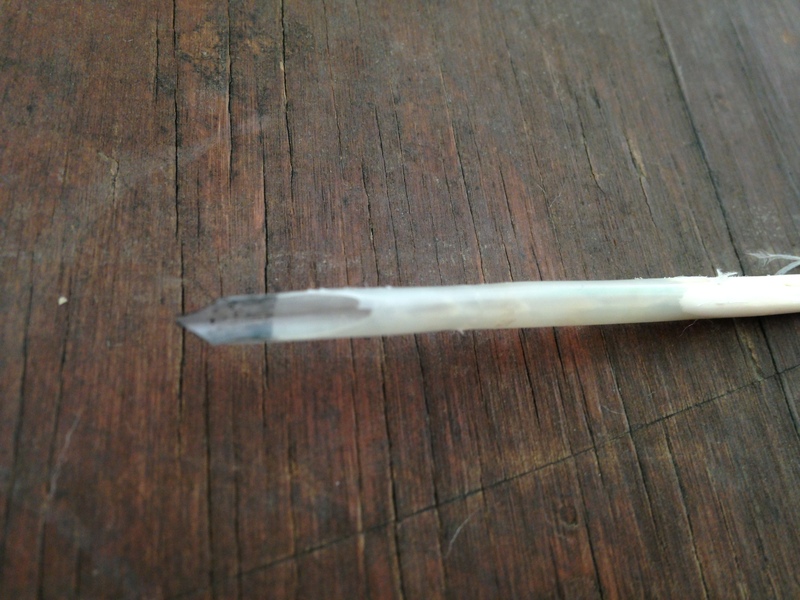 So I present a short tutorial on how to cut a quill pen based on THL Estelle de la Mer’s class taught on July 21, 2014. First, you need one wing feather of a goose, turkey, seagull, crow, swan, owl, or hawk. Ideally you want the “finger” feathers, which are the five longest feathers of the wing. If you don’t happen to have any large, dead birds lying about, you can get bags of Indian feathers from your local craft store, and from those handful of feathers you’re likely to find one usable feather — you’re looking for an intact, uncrushed tube and a significant portion of the transparent part (the cuticle). You’ll also need a “pen knife,” a knife that got its name from, you guessed it, cutting quill pens. 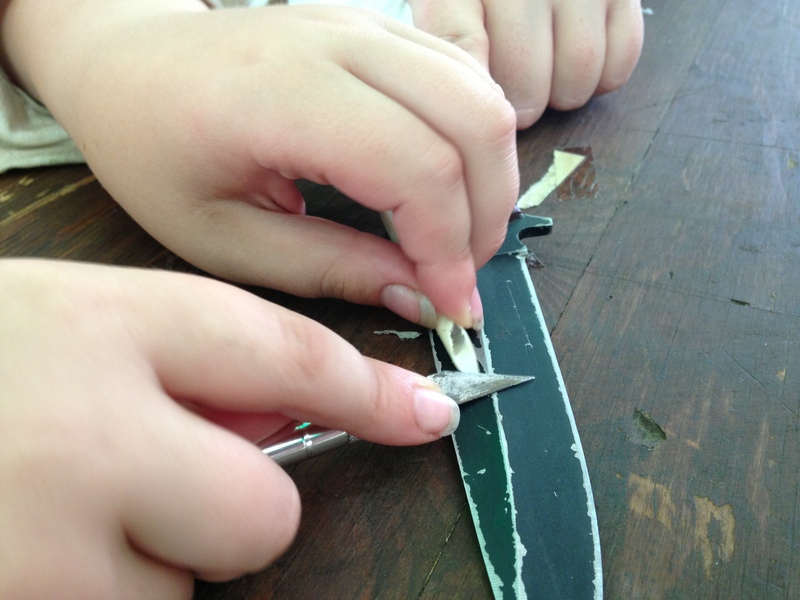 If you don’t have pen knife, a Swiss Army-style knife or an Exacto knife also works (and it’s what we used). You are looking for an extra sharp knife without serrated edges. Other items that are useful are scissors, tweezers and nail clippers! Step 2: Strip the feathers off your quill. I know they are lovely, but you’ll get more space for your hand if you remove most or all of the plume. Estelle showed us that you can simply grab and pull, and the plumage will strip right off. But if you have a problem getting them off, use scissors. 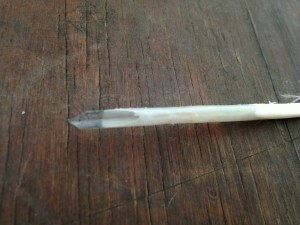 If the bottom of your feather’s shaft is ragged, you can also cut a bit of that off. Step 4: Make the first cut. Hold the point away from you and, starting from the top, cut a steep angled cut away from you. 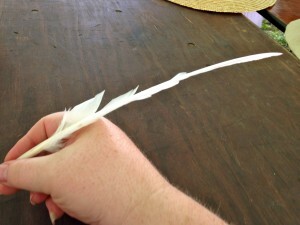 The cut should go all the way through the tube and should be as centered on where you want the top of your quill to be. Estelle says you need to put quite a bit of force behind it to get a good cut. Here’s my first cut, which was NOT quite long enough. 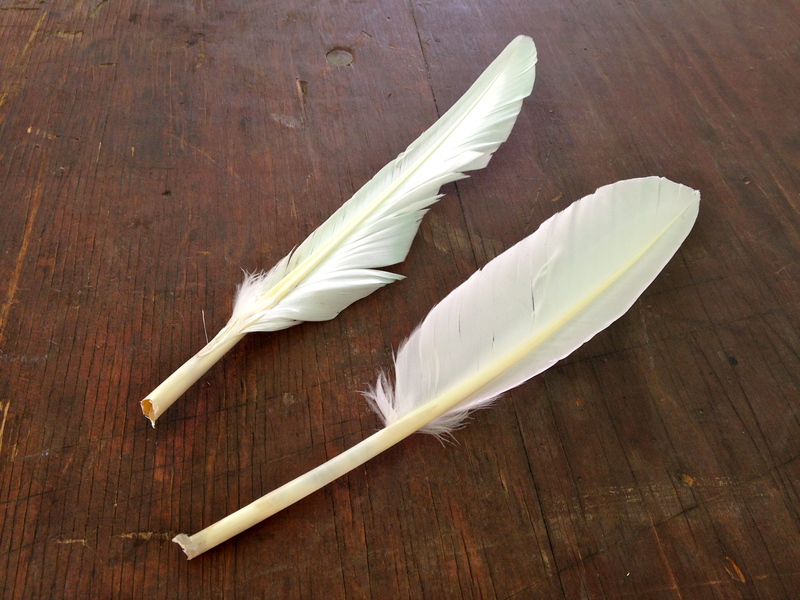 Step 7: Lay the feather so that the barrel is supported by your table, and with the blade perpendicular to the tip of your quill, carefully shave off the inner tips and outer curve of the feather, as shown below (image courtesy of Estelle). This gives your quill a thinner hairline. You will have to turn the feather over to get the other side, but the procedure is the same. Supporting the quill tip with a table or something sturdy is paramount, you can easily bend it at this point with too much pressure. Step 8: Cut the tip of the shaft flat. Estelle had us lay the feather tip flat and use a knife to cut the tip until we heard a snap. The wood table we were working on was too soft, so we had to use a piece of metal (all we had at the time was the blade of broad knife, which worked in a pinch). 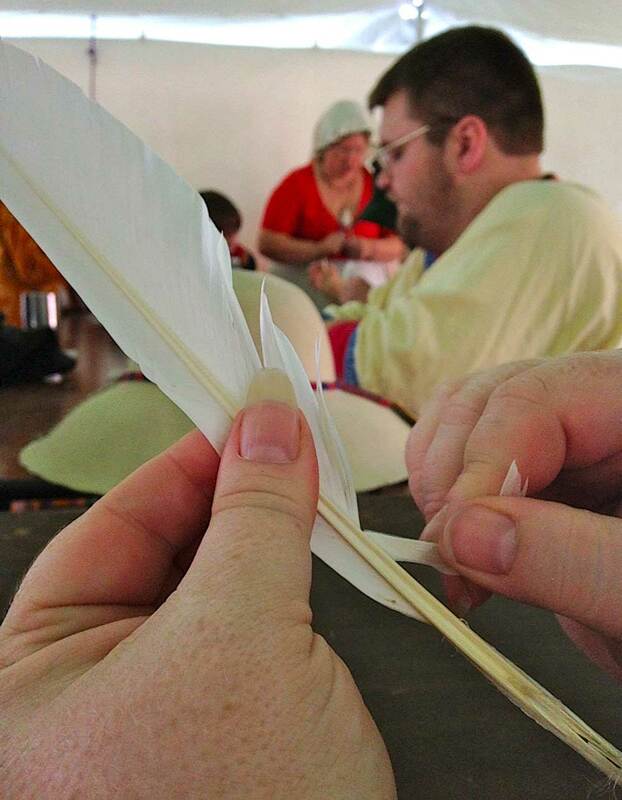 I was most impressed with how beautifully our quill wrote, despite our complete lack of experience (neither of us have done any scribal arts in the SCA). Wondering about a slit? 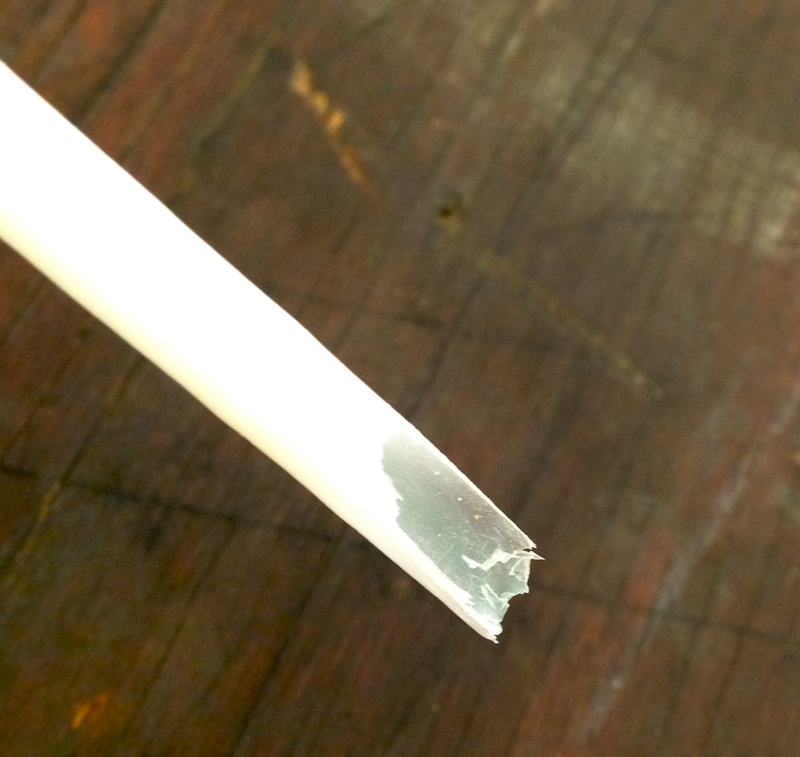 Estelle doesn’t recommend that you cut a slit for smaller nibs—it makes them splay and bend. Thank you for teaching us this important skill, Estelle! 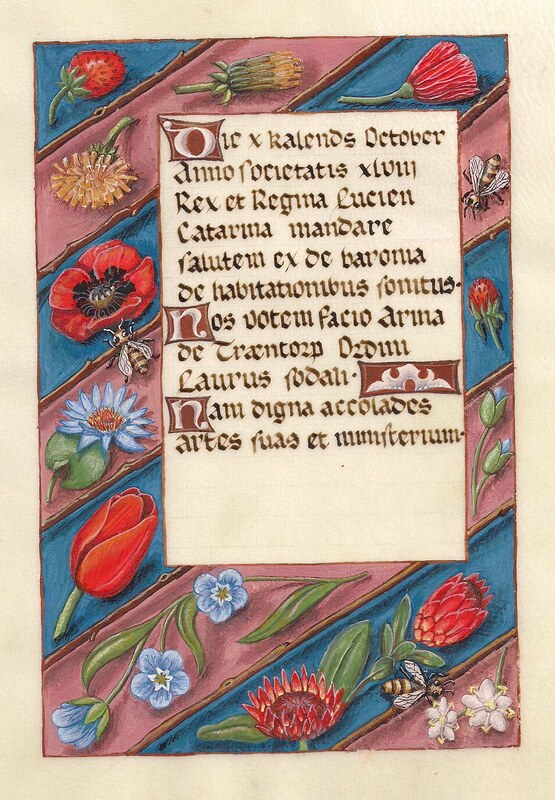 Estelle is apprenticed to Mistress Dulcinea Maria Magdalena von Muhlberg y Aguilar in calligraphy and illumination. She is a member of the Order of the Evergreen and the Order of the Dragon’s Heart. She is currently the Minister of Arts & Sciences and the Webminister for the Canton of Rimsholt as well the Dragon Signet of the Middle Kingdom. Her works have garnered two first places at Kingdom A&S (both illuminations). She tells me she is considering entering the Kingdom A&S Pentathlon one day—I hope she does, for I would love to see what she produces for such a challenge! 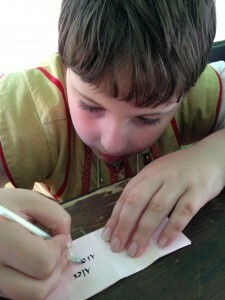 Twill Tape Nametag Tutorial: An Idea for Newcomer-Friendly SCA Events Family/Youth SCA Classes at Pennsic, Taught by Alexander!